Be mindful of the rivet lengths called out for in the plans here. Many are not correct. A rivet sizer is valuable. I was able to squeeze more of the rivets here among three different yokes: 1) 3", 2) longeron and 3) 4" deep no-hole. The remaining rivets (most the ones aft of the horizontal stab attach support angle) were bucked. The ones in the corners at the bulkheads were extremely difficult to do. I don't have any suggestions yet other than to be mindful of your bucking bar so it doesn't slip and wreak havoc. Working in the living room wastes a lot of time: I keep going up-and-down the stairs to obtain and return tools! Here is the aft deck fully riveted except for one AD470AD3 and the pesky corner rivets called out in red in the plans shot below. That lone AN470AD3 rivet just aft of the stab attach bars should not be a length -4 as called out for, but a length -5 (the material thickness is about 0.160" so with 1.5x protruding prior to bucking, the length should be 0.301 which is a -4.81 size rivet, or a -5). I'm still mulling over how to buck those corner rivets. I managed to buck two of them with reasonable results. One of them clenched over and another I didn't try. So I'll probably drill out the clenched rivet and try again. Once I research some different bucking bar shapes, I'll post on how I ultimately managed these guys. That took me, working solo, 5.25 hours. And I forgot to rivet in the nutplates on the longerons, so now I'll have to buck those rather than squeeze them. D'oh! In the end, I think it's easier with the nutplates off anyway, since bucking bar access is easier without them. Below are the results of removing the rightmost deck angle (F-1412C) rivet. As always, I start the process with my punch, then I drill a #52 through the shaft. Then a #42 through most of it, but not all. Then, with a lot of pressure, I drill the head with a #33 to twist it off. Then I used my #40 punch to drive the rivet out. You can see why I wanted this rivet out (left). Then I was concerned when my #52 hole seemed so off-center (center) but after removal, it was clear my drilling was spot on (right). 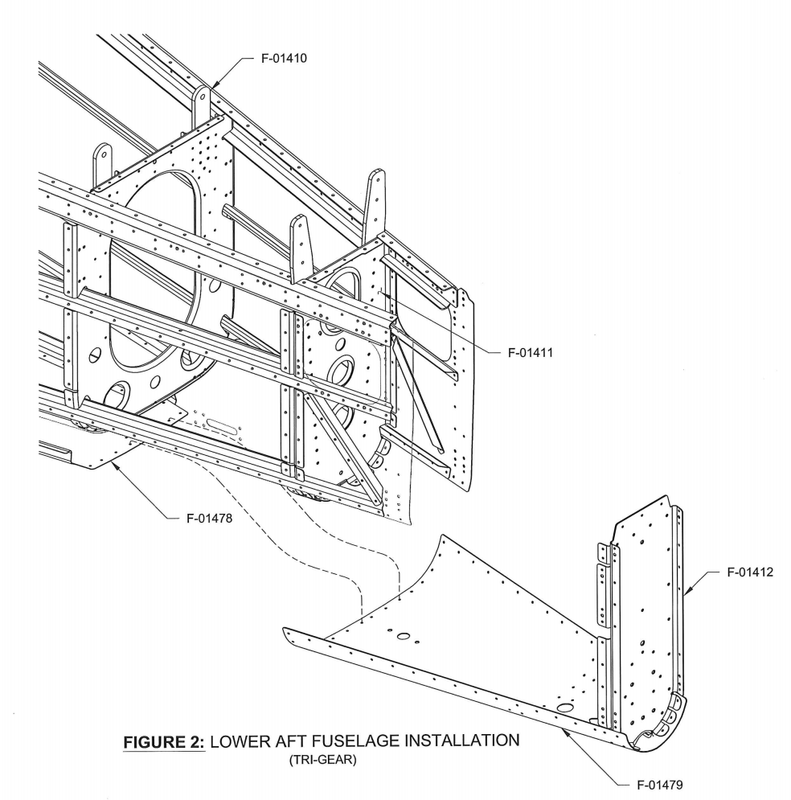 Empennage: Aft fuselage. Riveting bellcrank to bulkhead. 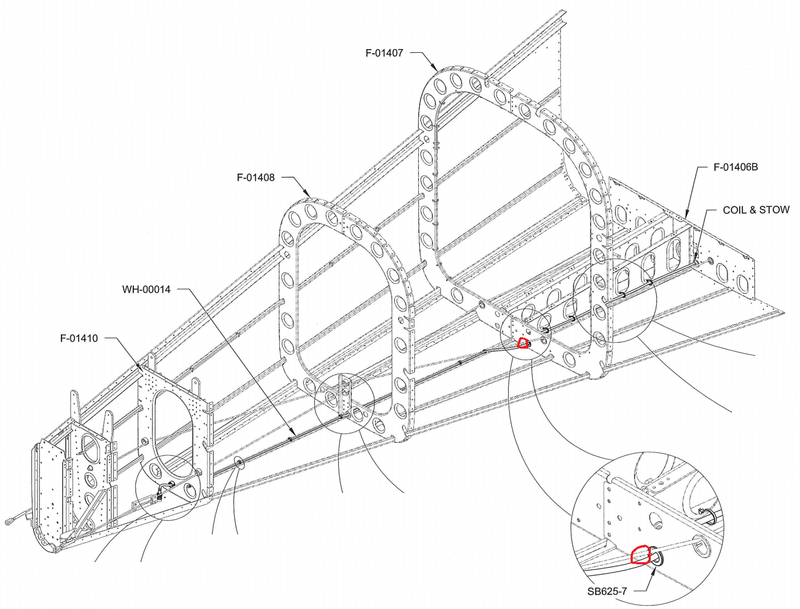 As previously mentioned, the plans neglect to instruct you to rivet the bellcrank ribs to the forward bulkhead. I didn't realize this until after the bottom skins were on the bellcrank ribs. Too bad, because it would have been easy to do prior to then. I was able to squeeze the middle rivet and buck the top rivet. But the bottom rivet would require a double offset set which is akin to taking your life in your hands (see next paragraph). So I used an LP4-3 on the left side. Problem solved. This is what happens when you use a double offset set in an awkward position. I tried this on the right side (the view is looking forward from the right aft). This rivet will need to be removed and replaced with an LP4-3. Here's what that looks like after removal. Yuck. I had to get a 12" #52 bit to use in conjunction with my 12" #40 and #30 bits. You can see I wasn't centered on the manufactured head, but I didn't do much damage to the bulkhead hole as I went very shallow into the head. For perspective, the rivet of interest is circled in red below. Empennage: Aft fuselage. Static plumbing installed. Installing the static plumbing is fairly easy. One challenge was removing the mandrels from the AD-42-BSLF blind rivets (which serve as the static ports). I ultimately used a #52 drill to drive them out after failing with a punch. Don't push too hard on the F plastic tee. You'll break it. $0.80 replacement from Van's (couldn't source it locally). I used a longer length than the plans call out for the static line tee upsizer. Don't worry, I later cut the top straight. Easily tested by blowing in the distal tube and feeling for air coming out of the ports. As an aside, some folks choose to install a more robust static line setup, an example of which can be found here. The rudder guides are installed in the aft fuselage. 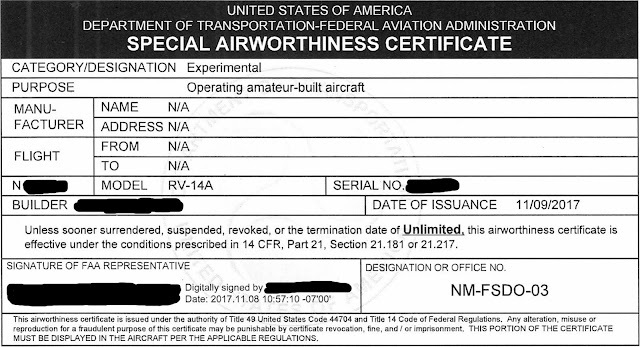 The plans call for AACQ4-4 rivets backed by NAS1149FN416P (a.k.a., AN960-4L) washers. There are two parts to the rudder cable guides and their thicknesses differ. Below are the left cable guides. On the smaller cable guide (F-01497B), the pull rivet retained a significant length of the mandrel. Must be related to the thickness of the guide as the right side (not shown) did the same. The AACQ4-4 rivet has a grip length of 0.126-0.250. 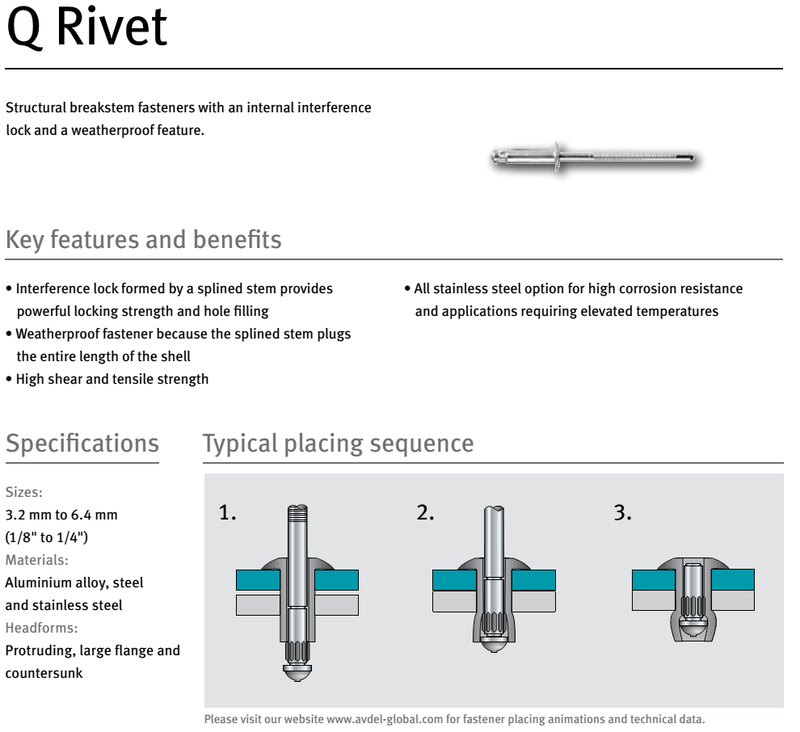 The rivet is a "Q Rivet" with a special interference mandrel (brochure here). You can watch this fun animation showing how it's supposed to work.. I'm guessing I'll have to pull those two rivets out and stack some more washers to get the thickness within the grip length. Empennage: Aft fuselage. Routing L1082 cable through aft bulkhead. The L1082 cable is supposed to go through the hole in the aft bulkhead. Presumably so it can power the light on the rudder. But the cable has a sort of bolus where the black wire is soldered to the white cable's shield. It's further layered by some shrink wrap. So it won't fit through the aft bulkhead's hole. I tried squishing that bolus with some pliers, but all it did was shorten it one dimension by lengthening it in another. So I took the shrink wrap off and it fit through the hole with just a bit of coaxing (!). As a sort of related aside, you can pull bushings out to fit things in later that wouldn't otherwise fit (the plans don't have you place the wiring in a good order, so sometimes you find yourself in a bit of a pickle). 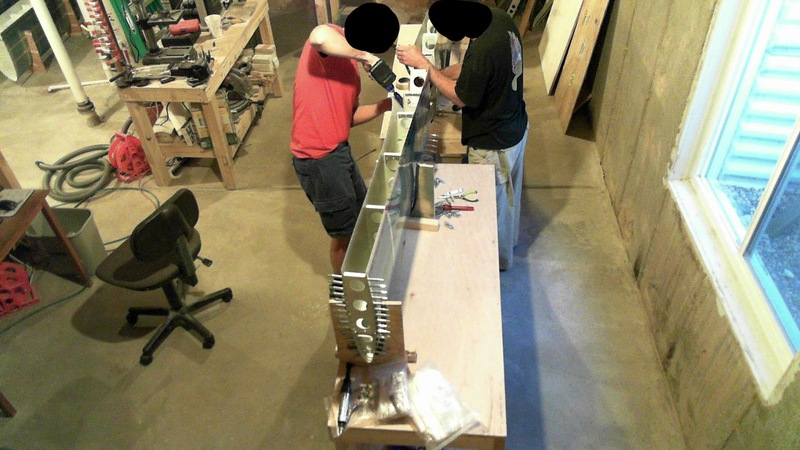 Empennage: Horizontal stabilizer redo. Completed. 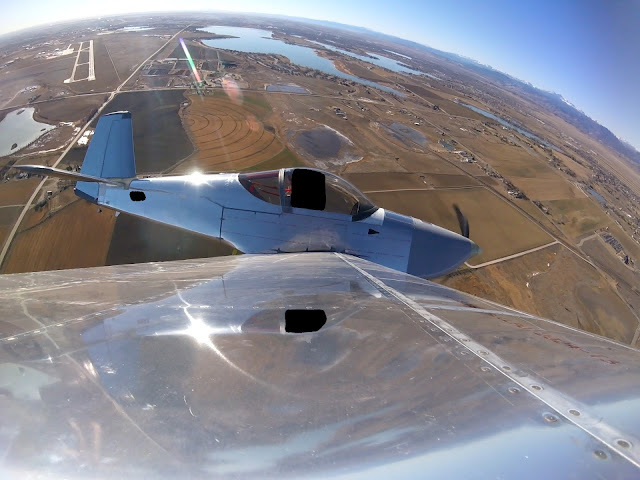 Visit the following for my thoughts on riveting the inspar ribs. And the following for my thoughts on rivet lengths on the inspar caps. First the nose ribs are riveted in, then they are riveted to the forward spar. Next the skins get riveted to the ribs and inspar stringers. To mitigate alignment issues, every single hole is cleco'd. I foolishly forgot to countersink the inspar ribs (hey, who needs to read the plans when this is your second stab?) and didn't realize it until the inspar assembly had its ribs riveted to the forward spar and after the first stringer rivet was in (I noticed the dimple wasn't sitting properly). However, we managed to get ourselves out of that jam by drilling out the inspar web rivets to give access to the inspar strings. Surprisingly, no damage was caused. Just some 4 hours of wasted time. When the rear spar was placed in the stab assembly, the left outboard side didn't seem to cleco in properly. I tried changing the cleco order a few times to improve it. I finally got it to a reasonable alignment. But then, the left outboard rib's aft flange didn't line up well with the rear spar, however it eventually got coaxed to fit with the help of a pin punch and some light tapping. After all riveting was done, everything lined up just fine. As the riveting progressed, the left outboard alignment improved to essentially perfect. 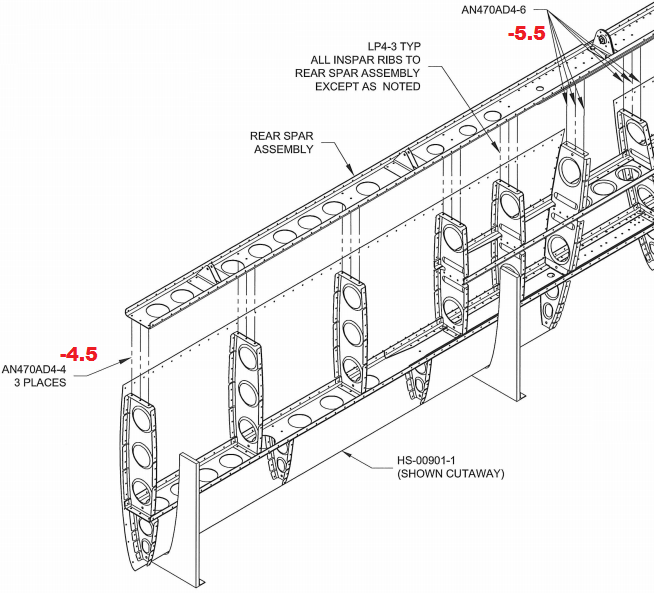 The outboard ribs' aft flange-to-rear spar rivets are called out as AD4-4. Length -4.5 is more appropriate so I used my rivet cutters to fashion those. 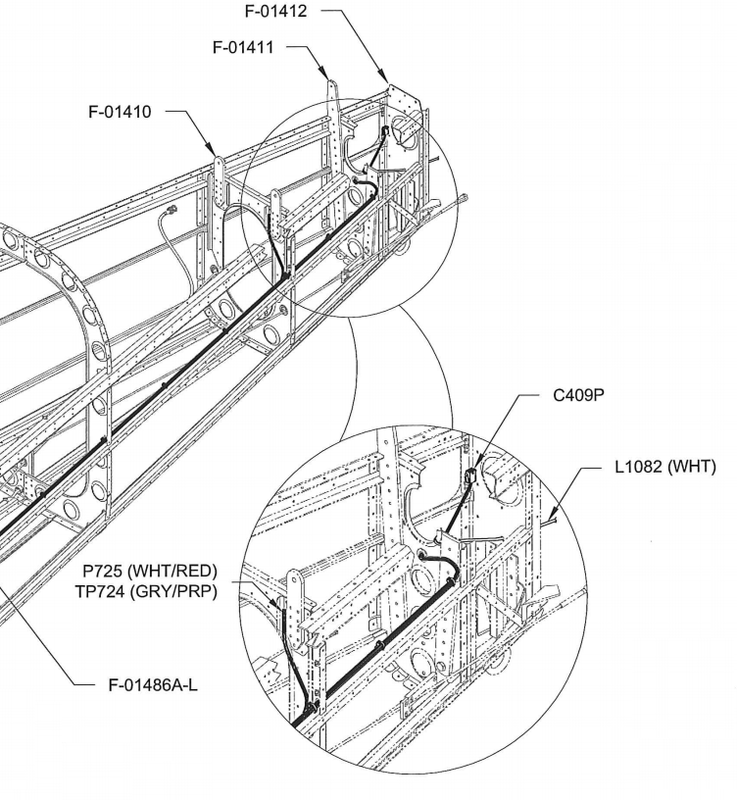 Similarly, the plans call for AD4-6 for the inspar ribs-to-rear spar. Length -6.5 is more appropriate. The below picture shows a -7 in the center and two -6.5 length on the sides on the right inboard inspar rib. Looking down left outboard side. And completed! 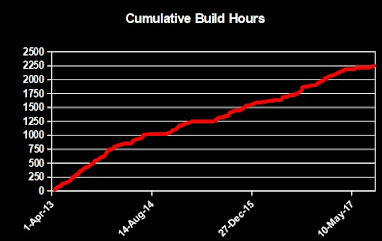 37.18 hours from start-to-finish. Empennage: Aft fuselage. Bottom and side skins on. I'm out of space in my small living quarters. So we (my -9A friend and I) riveted the bottom and side skins together in the entryway. I chose not to back rivet after trying a few and not being satisfied with the results. Others prefer back riveting and will surely have a nicer finish as a result. It really pays to read this entire section in the plans prior to starting. Several steps are completed out-of-order (e.g., wiring harnesses) and some are missing entirely (e.g., when do the bellcrank ribs get riveted to the bulkhead?). And many rivet lengths are inaccurate: Most AD3 rivets not relating to the overlap of two layers were short by 0.5. A rivet sizer is valuable. Here is everything cleco'd up, every other hole, on some saw horses. Eventually all holes were filled with clecos. Be sure to tape off the holes that don't yet get riveted. Flip it over when ready to rivet. My buddy stayed under the structure on a wheeled desk chair with the bucking bar and I stayed outside with the gun. Yes, my front door was open in order to take this picture. The phone cable (WH-00059) could not fit through the SB437-4 bushings in the bellcrank ribs because the RJ-11 connector is too big. Another -14 builder I know simply drilled the bushing holes to the next size. I found it easier to simply snip the RJ-11 connector off, route the cable and then crimp a new connector on as I already have the requisite tool. Yes, the thick F-01479 bottom skin really does go between the F-01410 bulkhead and F-01478 bottom skin. No, it is not easy to make that happen. The F-01412 aft bulkhead's tabs overlapped the F-01473-L/R side skins. Unfortunately, this wasn't noticed until after it was impractical to remove the piece. Rather than risk Dremel'ing, we used the bucking bar strategically to bend the tab across the gap in the overlap before setting the rivet. I suppose we could have filed it down and that probably was the better option. Don't worry, that dimple on the right image isn't cracked. It's a superficial primer scratch. I got worried after I saw it in the picture too! Side skins completed in approximately 15 hours. View from the front door when open. My new roommate will be couch surfing for a while until he gets a place of his own. At least he has some good company next to him. After plumbing the static lines and doing some more harness work, the rest of the structure will eventually be completed. Where the side skins meet the longerons, I had to press out the dimples I made in the side skin for the access panel. I was aimlessly following the plans and dimpled the skins there for flush screws. Turns out, the plans are very specific on page 10-14, step 11 to not dimple the two screw holes in the skin where they meet the longerons. Oops. Here's what the pressed out dimples, that were then countersunk through to the longerons, look like (will need to spot prime). If the skin later cracks, it's in a location that can easily be stopped drilled if it doesn't propagate to a nearby edge. Another option is to go deeper with the countersink or upsize to a larger hole and screw (my tech counselor provided those ideas).